Miracle in Carytown | Cover Story | Style Weekly - Richmond, VA local news, arts, and events. Scott Elmquist Mattias Hägglund, owner of the Jasper bar, holds a promotional flier for his pop-up Christmas cocktail bar. There's a light, fuzzy feeling Mattias Hägglund gets when thinking about his favorite holiday of Christmas. When he gets that familiar, nostalgic feeling, he tends to drift off thinking about family memories by the tree. He also well knows the warm and special feeling that can bubble up from the bottom of a craft cocktail. Naturally, he's combining the two at his Carytown bar. The owner of the Jasper at 3113 W. Cary St. will serve up a special brand of rosy-cheeked Christmas cheer as he opens the cocktail bar's doors for its first holiday season. Jingle Balls Nog, Christmapolitan and Bad Santa are just a few of the cocktails the Jasper will serve when it transforms into a holiday pop-up, opening on Black Friday. "If someone in Richmond was going to do a holiday themed pop-up, I can't imagine anywhere better than dead center in Carytown," Hägglund says. 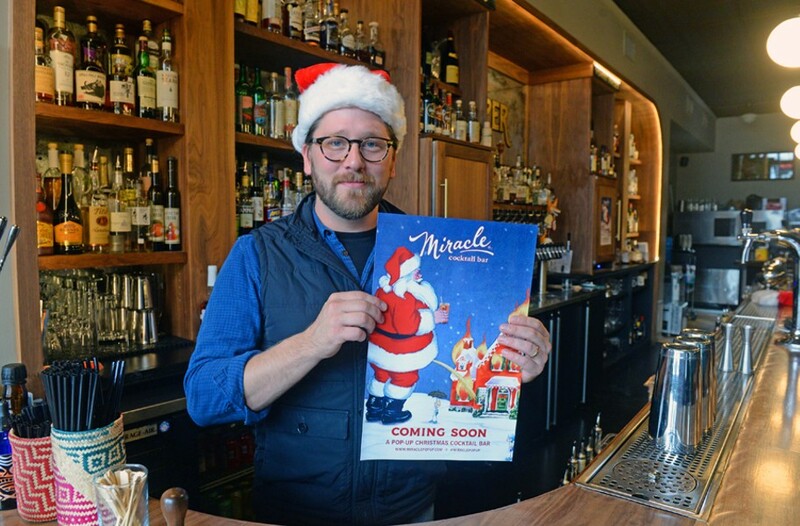 Jasper will be the first bar to bring Miracle, a growing Christmas pop-up franchise, to Virginia. The drinks are created by Miracle Manager Joann Spiegel and esteemed bartender Nico de Soto of Mace in the East Village of New York, where the pop-up originated in 2014. "Some cocktails return year after year," Spiegel says. "A couple that return are adaptations of the ones that came before." In January each year, Spiegel and the Miracle team cull the drinks through feedback from exit polls and meetings with partners like Hägglund. One of the most popular drinks continues to be the Snowball Old Fashioned. This year, it will be crafted with butterscotch rye, Spiced Demerara, wormwood bitters and orange zest. The Miracle menu will be featured at more than 90 international bars. It all started four years ago when Miracle creator Greg Boehm was frustrated with slow construction on the now award-winning cocktail bar, Mace. He was eager to open his restaurant for the holidays. His mother responded with an idea to turn the unfinished space into a holiday-themed pop-up. "It was an unexpected success," Spiegel says, recalling there was a line down the block. "I don't know how such a cute little Jewish woman came up with such a good Christmas idea." Hägglund and Thomas Leggett met Spiegel and Boehm in Manhattan two years ago. The two Richmond-famous bartenders were on a research trip to smooth out their final concept for the Jasper. Spiegel proposed the two bring Miracle to Richmond. "When you know you connect with someone and the energy is right, you make it happen," Spiegel says. "It has to be a special kind of partner. We were willing to wait two seasons to bring it to Richmond." By last year, 50 bars had joined the Miracle pop-up conga line. The Jasper joins a list of participating bars inching toward a hundred during the 2019 holiday season. The Jasper is calling its version Miracle on Cary Street. The bar will serve some of its regular cocktail menu items, but focus its selection on the 10 cocktails developed by the Miracle team. Hägglund and his crew are working with theater set designer Adam Dorland to physically transform the space, as well. They'll even replace the nondescript sign out front to ring the final bell on the holiday theme. In addition, Miracle on Cary Street also will sell signature holiday mugs with 10 percent of sales donated to Action Against Hunger, a global humanitarian organization that started in Paris.